Full-blooded Mohawk Louis Bruce was one of the earlier Native Americans to reach the majors. He got into 30 games with the Philadelphia Athletics in 1904, during a pro career that ran from 1900 to 1907. He was small (5’5” and 145 pounds) but hit for good averages in the minors while playing numerous positions. He was also a good little pitcher, though he made just two relief appearances for Philadelphia. His teammate with the A’s, the great Ojibwa pitcher Chief Bender, had looked up to him when both were at the Lincoln Institute for Indians some years before. Bruce was a serious and intelligent man. His baseball career helped finance his education; before joining the A’s, he graduated from the University of Pennsylvania School of Dentistry. Bruce went on to obtain another degree in theology from Syracuse University and became a Methodist minister. He served 11 different churches (including tribal congregations) in central and upstate New York over a 38-year period. In addition, Bruce sought to help indigenous peoples in secular life. He was an active proponent of the Indian Citizenship Act of 1924, which granted Indians suffrage. His son, Louis Rooks Bruce, carried on this tradition as an organizer of the National Congress of American Indians (founded in 1944) and U.S. Commissioner of Indian Affairs from 1969 to 1972. Bruce’s parents were John Bruce and Christine Benedict. Further detail on siblings is scanty, though the 1887 census of the St. Regis Mohawk Reservation shows John Bruce as the head of a household of seven. John was a Mohawk chief, although his basic occupation was farming. Louis eventually inherited the family property and later passed it on to his son. One of John Bruce’s most remarkable accomplishments, however, was fighting on behalf of the British crown in Africa in the mid-1880s. He was part of a contingent of about 60 Mohawks in the expedition that attempted to rescue General Charles Gordon when he was besieged in Khartoum, Sudan. Bruce served as a boatman, won two medals, and was taken on visits to Asia and Australia. At the age of seven, Louis Bruce went to live and study at the Lincoln Institute in Philadelphia, which was founded in 1866. According to his grandson, Don Bruce, “Grampa was one of the few Indians who wasn’t taken away to school – he wanted to go. He always wanted to further himself in life.” In addition to his studies and athletic pursuits, at Lincoln Louis met a girl named Noresta Rooks, who was born in Nebraska to a mixed-blood Sioux mother and a Caucasian father from Missouri. Their friendship later blossomed into marriage in 1904. Bruce went from Lincoln to Philadelphia’s Central High School, “where he excelled as a student and as an athlete before graduating with an A.B. degree in 1899.” According to a 1903 article in Sporting Life, he “played with Westchester, Atlantic City, and Morristown, semi-amateur teams. He started out as an outfielder, and began pitching in 1899 for Morristown.” He was discovered by Ed Barrow, who later attained fame as manager of the Boston Red Sox and then as business manager of the New York Yankees. Barrow became manager of the Toronto Maple Leafs in the Eastern League in 1900, and Bruce was one of his first signings. 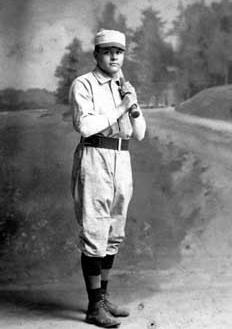 In 1901, Bruce lifted his average to .322 in 101 games. Baseball-reference.com shows no records for him as a pitcher that season; a May account in Sporting Life showed that Ed Barrow had focused him on left field, though there was “talk of putting Bruce on the rubber again.” Indeed, he did pitch at least once that year, a complete-game 4-2 win on May 28. In the fall of 1901, Bruce began attending dental school at Penn. By that time, his family was living on Cornwall Island, Ontario, on the St. Lawrence River, very close to his birthplace. Bruce excelled with Toronto in 1902, in particular as a pitcher. He was 18-2 in his 20 appearances for the Eastern League champions, allowing just 38 runs and pitching five shutouts. As Sporting Life wrote that June, “the Toronto Indian is pitching a wonderful article of ball for Ed Barrow. Bruce is one of the most valuable men in the league, all positions appearing the same to him.” He batted .313 in 88 games overall, as his season did not begin until May 15 owing to his school commitment. That year, Arthur Irwin – the Toronto native and former big-leaguer who succeeded Ed Barrow as manager of the Leafs – hung a $5,000 price tag on Bruce. That reportedly scared away some clubs, but not the Philadelphia Athletics. Connie Mack purchased Bruce’s rights that September, later turning over pitcher Connie McGeehan (who was 1-0 in his only three big-league appearances for the A’s in 1903) as partial consideration. Bruce married Noresta Rooks, also known as Nellie, on February 20, 1904. Shortly thereafter, he finished dental school. He was vice president of his class in his senior year, captain of the class baseball team, and manager of the class football team in 1903. Bruce did not report to the A’s until after they finished their “western” swing – St. Louis, Chicago, Cleveland, and Detroit – on June 18. He made his debut on June 22 and appeared in 30 games altogether for Connie Mack, batting .267 in 112 plate appearances with no homers and 8 RBIs. He had three extra-base hits, all doubles, out of his 27 safeties. Of his two pitching appearances, one was a strong effort in long relief on July 6. On the road in New York, he allowed one run on three hits in six innings after the Highlanders took an early 6-0 lead (the final was 7-1). In the other, on July 21 at Philadelphia, he entered in the fifth inning as Cleveland led 8-1. This time he was hit hard, giving up six runs (five earned) in five innings. As a result, his final ERA in the majors was 4.91. In late July, Sporting Life wrote, “Bruce is available as a pinch hitter and all around substitute, but apparently not quite the real thing, either as outfielder or as a pitcher.” On August 16, the Hartford Courant added, “Connie Mack does not think as much of Bruce as he did in the spring. He has sent the little bronze-faced pitcher to the Toronto club for more experience.” Philadelphia loaned Bruce to Toronto, which badly wanted him back. He got into 16 games for the Maple Leafs (.171, 4-3 as pitcher) and rejoined the A’s in mid-September. His final game in the majors came on the season’s last day, October 10. On May 6, however, Sporting Life reported, “Louis Bruce has been disposed of by the Athletic Club to the [Indianapolis] Hoosiers. . .The lad’s hitting was not up to Manager Mack’s requirements.” The manager in Indianapolis was old friend Ed Barrow. Bruce got into 132 games that year in the American Association, batting .252 and posting a 1-2 record on the mound. His career trailed off after that, as he played just 30 games for Columbus (also in the AA) in 1906. He turned down a deal to become manager-captain of Newark that June, as he hoped to return to Toronto. Bruce then returned to family life. He and Nellie welcomed their other child, a daughter also named Noresta, in 1908. Son Louis had arrived near the end of 1906. “By 1910, Bruce had finished his degree in theology, gave up his job as a mechanic in a typewriter company and began his Methodist ministry on the Onondaga Indian Reservation.” He also established a dental practice in Syracuse at that time. Bruce, a “stern but loving” father, instilled this value in his son. He sent young Louis to Cazenovia Seminary, a Methodist school in Cazenovia, New York, where the lad was the only Indian student. Bruce was also strongly against drinking alcohol, the scourge of so many Indian nations. “The great battle of [Bruce’s] life was for Indian citizenship and he campaigned on all the New York reservations.” In 1921, The Southern Workman identified him as “among the noteworthy leaders of the citizenship movement.” There was a serious debate among the six Iroquois Nations on this topic, though. 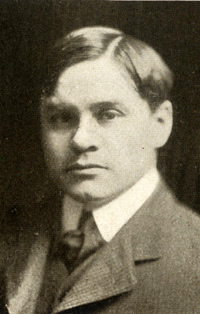 In May 1919, the New York Indian Welfare Society met to confer on “their present and future needs. . .The temporary chairman was Jesse Lyon, the courier of the Six Nations. Mr Lyon is a stalwart exponent of the old regime and is bitterly opposed to citizenship, preferring the citizenship of his tribe to that of the United States.” Even so, at that meeting Bruce was elected an officer of the society. One wonders what Bruce would have thought of developments in the Mohawk nation in more recent years: casinos, tax-free cigarette and gasoline sales, and outbreaks of violence on the St. Regis Reservation. It’s probably safe to conclude that his beliefs in religion and citizenship would have led him to deplore all these things. Bruce retired from his ministry in 1949. Six years before, his wife Nellie had died. The widower survived her for a quarter-century; among other things, he instructed his grandson when Don played baseball as a youth. He died at the age of 91 on February 9, 1968, at his daughter’s home in Ilion, New York. Although his big-league career was brief and took place over a hundred years ago, Louis Bruce’s conduct off the field remains his enduring accomplishment. As a 1922 Methodist publication observed, “he was said by Connie Mack to be 'one of the best influences he ever had on the team.'" With thanks to Don Bruce for memories of his grandfather. Richardson, Jane. Chief of the Chiefs (biography of Bruce’s son, Louis Rooks Bruce). Colorado Springs, Colorado: Thistle Publishing, 2008. Abstracts from this book are available at the author’s website: http://www.janerichardson.com/chiefofthechiefs/default.asp. Swift, Tom. Chief Bender’s Burden. Lincoln: University of Nebraska Press, 2008: 23. Baseball references list Bruce as having the middle initial R., but according to grandson Don Bruce, there was no middle name. Benn, Carl. Mohawks on the Nile. Toronto, Ontario: Natural Heritage Books, 2009. Gridley, Marion Eleanor. Contemporary American Indian Leaders. New York: Dodd, Mead, 1972. Gridley, Marion Eleanor. Indians of Today. Chicago, Illinois: Indian Council Fire, 1960: 35. Descendants of John Rooks, online family tree (http://familytreemaker.genealogy.com/users/c/o/f/Harold-E-Coffman/GENE4-...). Supported by various other genealogies. “Pitcher Bruce Married.” Sporting Life, February 27, 1904: 5. “Louis R. Bruce (1877-1968).” Biographical sketch in the University of Pennsylvania online archives. In 1849, an Act of Assembly gave Central High the power to confer academic degrees in the arts upon its graduates – a distinction that was rare, perhaps unique, among American high schools. “The Athletics’ New Pitcher.” Sporting Life, October 17, 1903: 10. Levitt, Daniel R. Ed Barrow. Lincoln: University of Nebraska Press, 2008: 38. “Toronto Tips.” Sporting Life, March 2, 1901: 8. Miley, Frank. “Toronto topics.” Sporting Life, May 11, 1901: 15. Sporting Life, June 8, 1901: 8. Sporting Life, October 4, 1902: 12. “News and Gossip.” Sporting Life, June 28, 1902: 13. “Toronto Topics.” Sporting Life, April 12, 1902: 12. “National News.” Sporting Life, October 11, 1902: 7. Mulford Jr., Ren. “Balldom’s Capital.” Sporting Life, September 5, 1903: 9. Richter, F.C. “Local Jottings.” Sporting Life, November 14, 1903: 5. Richter, Francis C. “Quakers’ Quiver.” Sporting Life, June 4, 1904: 5. Richter, Francis C. “Quaker Quips.” Sporting Life, July 30, 1904: 2. “Baseball Notes.” Hartford Courant, August 16, 1904. “Quakers Quail.” Sporting Life, October 8, 1904: 1. Richter, Francis C. “Philadelphia Points.” Sporting Life, March 18, 1905: 3. “Pennant Races Begin This Week.” Chicago Tribune, April 9, 1905: A1. Richter, Francis C. “Philadelphia Points.” Sporting Life, May 6, 1905: 18. “Ohio-Pennsylvania League.” Sporting Life, June 16, 1906: 8. “Binghamton Briefs.” Sporting Life, August 17, 1907: 15. Raymo, Denise A. “Major presence.” Plattsburgh (New York) Press-Republican, September 4, 2011. Parker, Arthur Caswell. A Prehistoric Iroquoian Site on the Reed Farm, Richmond Mills, Ontario. Rochester, New York: The New York State Archeological Association (Morgan Chapter), 1918: 93. Gridley, Contemporary American Indian Leaders: 41. King, C. Richard (editor). Native Americans in Sports, Volume 1 (A-L). Armonk, New York: M.E. Sharpe, Inc: 2003: 63. Parker, Arthur C. “The New York Indians.” The Southern Workman, Volume 50, 1921: 159. New York State Museum Bulletin. Albany: University of the State of New York, November-December 1919: 16. Woman’s Home Missions, October 1922: 12.